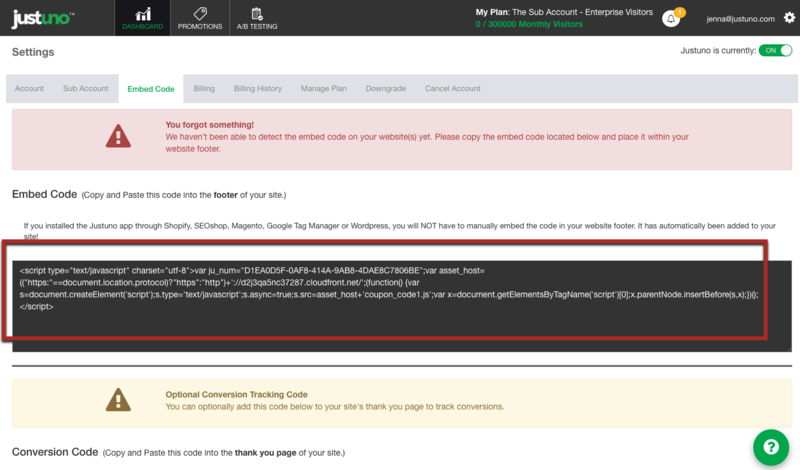 If you installed the Justuno app through Shopify, SEOshop/Lightspeed, Magento, Google Tag Manager or Wordpress, you will NOT have to manually embed the code in your website footer. It has automatically been added to your site! This does not cover the checkout sections for most platforms. So you will want to review and embed the checkout section if needed. Trouble Shooting Tips: If the detection system is not registering that the code has been placed on your site within our dashboard, simply refresh the dashboard and the notification will disappear! There you will find a tab labeled "Embed code"
If our asynchronous route is not desired, you can use the following code snippet to help change the outcome. This would go into the head tags of the site. This is simply to help us load first, not faster. Helps with promotions using our age verification plugin.